The foreign secretary is visiting the United Arab Emirates and Bahrain on the last day of his tour of Arab nations. 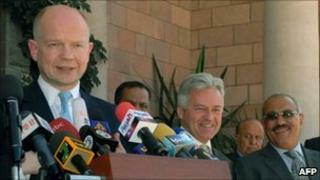 William Hague's three-day trip was organised in response to the wave of popular protests in the region. He is expected to reiterate calls made in Tunisia, Jordan and Yemen for political reform and greater respect for human rights. But he will also focus on the growing importance of trade and investment links between the UAE and the UK. A wave of protests has spread across north Africa and the Middle East following the ousting of Tunisia's President Zine al-Abidine Ben Ali last month. The most prominent demonstrations have been in Egypt, where several hundred people are thought to have died during an uprising aimed at unseating President Hosni Mubarak. Tunisia was Mr Hague's first calling point on the three-day, five-nation tour. There he met members of the new interim government and announced UK funding for projects aimed at promoting social and political reform. He then moved on to Jordan, also the scene of recent protests, where he issued a wider warning about the need to make urgent progress on the Middle East peace process. Throughout the trip, Mr Hague has posted updates on the micro-blogging website Twitter and in the latest he spoke of his time in the third country on his tour. He wrote: "Spent the day in Yemen to discuss reform & security issues with the President. Huge challenges in both areas." BBC diplomatic correspondent James Robbins, who is travelling with the foreign secretary, said there would be a shift in emphasis on the final day of the tour to bring in economic as well as political matters.